the same thing, over and over again. to keep on like we had a brain. This entry was posted in Photographs, Poems 2011. Bookmark the permalink. I think that trees should have been named number one in the Seven wonders of the World. I wonder how old this sycamore tree is? I am in awe of this specimen withstanding the whims of nature. It exemplifies the word, steadfast, for me. Thanks, Phylliss, I agree. I tend to personify trees in my poetry, trying to look at the world through their eyes, that gets to be pretty pantheistic more often than not. I imagine that this tree is 100-150 years old, but no telling how old the root ball may be. 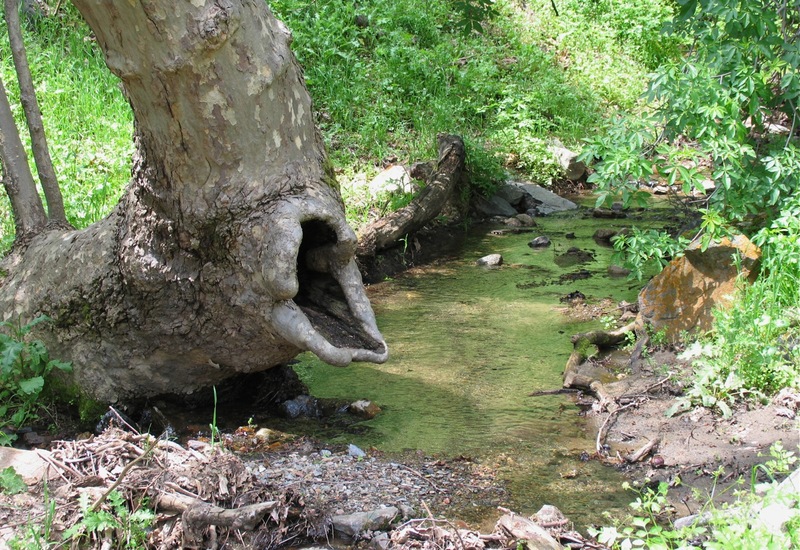 We have many 300-400 year-old trees, that are really stems grown out of a root ball, on Dry Creek, one of the largest Sycamore Alluvial Woodlands in the world. One exposed root ball here measures approx. 15′ x 20′ that I would imagine is much, much older than its stems. Robbin photographed an interesting oak last week that also looks quite human – we’ll post it shortly. I think they all have something to tell us if we have the eyes to see.